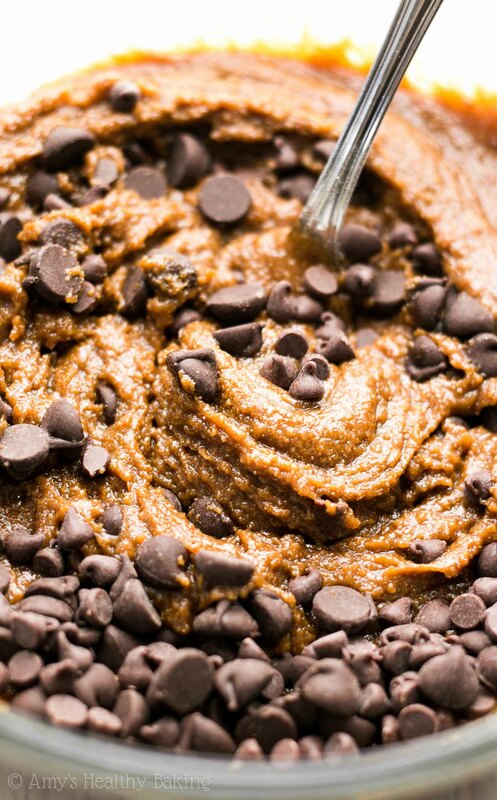 An easy recipe for guilt-free chocolate chip cookies made in the crockpot! 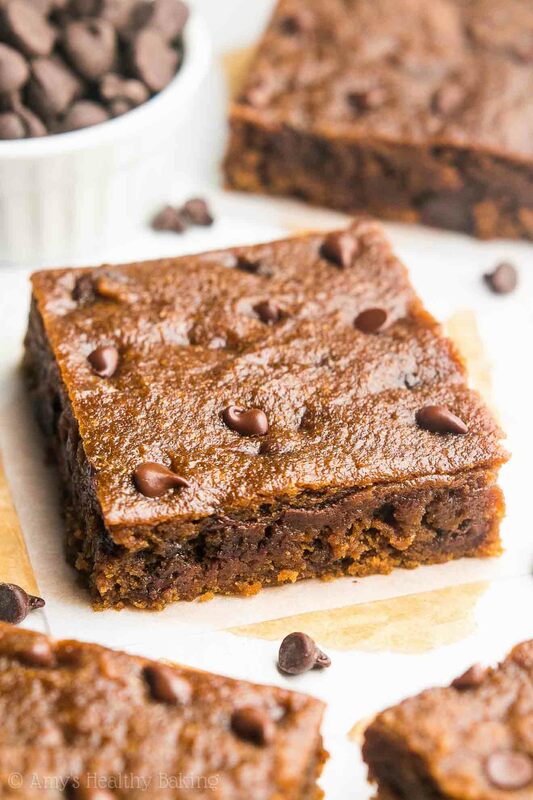 Sweet, chocolaty, almost-fudgy-like-brownies bliss… Nobody ever believes these are healthy! Although most people scattered as soon as finals week finished, I stayed in my college town after my sophomore year and worked in an organic chemistry research lab. Every weekday after exercising, showering, and savoring a bowl of my favorite Trader Joe’s cereal, I hopped on my black-and-teal road bike, pedaled two miles through city streets and half of the campus, and locked it to one of the many racks outside of the chemistry building, along with about a hundred other bikes, before climbing the two sets of stairs to the third floor. Once inside, I tugged off my backpack and flipped through my notebook, skimming over my notes from the previous day, to scribble down a schedule for that morning and afternoon. After setting down my pencil, I slid on my stiff white lab coat, a set of safety glasses, and a stretchy pair of bright purple nitrile gloves, then began measuring out chemicals on our highly sensitive scale, mixing them together in small round glassware, and analyzing the results a few hours later. As one of only two undergraduates in the lab, I spent the majority of my free time in between experiments and during lunch breaks talking with the many graduate students about anything and everything: chemistry, reaction mechanisms, baking, baseball, life in general… We arrived before 9 am and stayed until dinner, or sometimes even until after the sun disappeared, so we had lots of time to chat—and with temperatures consistently around 100°F outside, we only half-joked about enjoying the “free” air conditioning and keeping our apartments’ electricity bills low every day! But since we each possessed a huge sweet tooth, my roommates and I still baked a few times during that summer. (No, they weren’t chemistry majors too—just me!) We tried to turn on the oven during the “cooler” days where the temperature barely reached 90°F to avoid turning the entire apartment into a sweltering sauna, and we almost always picked something quick and classic. Chocolate chip cookies appeared on the cooling racks the most, and paired with a tall frosty glass of milk, we slowly savored every warm, gooey bite of those treats while sitting in front of our portable fans! 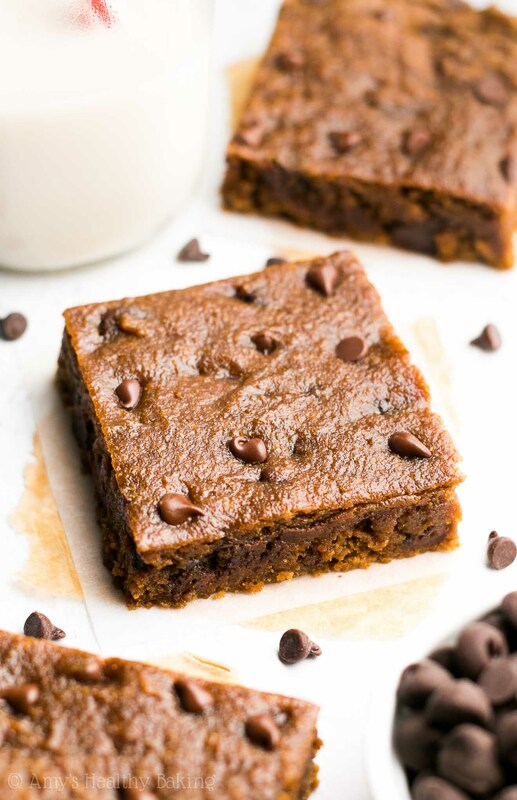 If only I had thought to create this recipe for Skinny Slow Cooker Chocolate Chip Cookie Bars back then… That would’ve been a lifesaver! 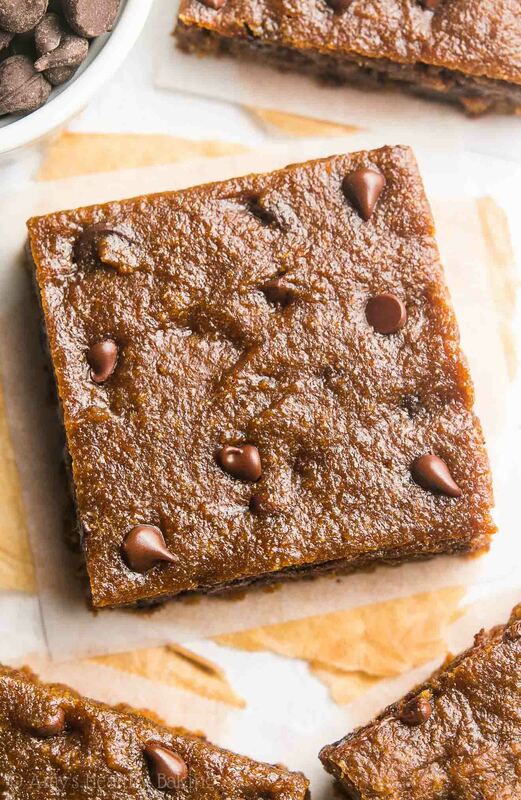 The same sweet dough and rich melty chocolate, warm and gooey and oh-so-irresistible… Made guilt-free with no oven and no butter, refined flour or sugar! To start, you’ll need—you guessed it!—a slow cooker. This is the one that I own. It’s an oval-shaped five-quart model by Hamilton Beach. A six-quart slow cooker should work (just keep an eye on the bars since they’ll finish baking in less time! ), but I highly recommend against using any other size. To make clean-up a breeze, you’ll line the slow cooker with foil first, then lightly coat that with cooking spray. This little trick also makes it much easier to lift the cookie bars out of the slow cooker once they’ve cooled! For the cookie dough base, you’ll use white whole wheat flour. White whole wheat flour is made by finely grinding a special type of white wheat, whereas regular whole wheat flour comes from a heartier variety of red wheat. This gives white whole wheat flour a lighter taste and texture, similar to that of all-purpose flour, but it still has the same health benefits (think extra fiber!) as regular whole wheat flour. Note: Whole wheat pastry flour would be a great substitute, and I’ve included my preferred gluten-free flour in the Notes section as well. To sweeten the cookies, you’ll mix in coconut sugar instead of refined sugar. Coconut sugar is exactly what it sounds like: sweetener that comes from coconuts. But no, it doesn’t actually taste like coconuts! Coconut sugar has a slight caramel-like flavor, very similar to the taste of brown sugar, but it pours like granulated sugar. Its deep brown color is the reason these bars look so dark, but that hint of a caramel taste makes them out-of-this-world amazing! And of course, the most important part… The chocolate chips! You’ll add in a combination of dark chocolate chips and mini chocolate chips. This trick ensures you taste a morsel of chocolate in every bite—a complete necessity for a chocoholic like me! (That’s why I wrote my Healthier Chocolate Treats cookbook!) These are my favorite dark chocolate chips, and these are my favorite mini chocolate chips because they both melt really well and taste incredible. You’ll “bake” the cookie bars on the slow cooker’s low setting for a couple of hours. They’ll be done when the sides look set and firm but the center still looks slightly moist and gooey. You’ll let the bars cool completely to room temperature in the slow cooker, and the heat from the slow cooker will continue to cook the center during that time. When they’ve finished cooling and have set, they’ll have almost the same texture as fudgy brownies—absolutely irresistible! Who’s ready for dessert? And when you make your own, remember to snap a picture and share it on Instagram using #amyshealthybaking and tagging @amyshealthybaking IN the photo itself! (That guarantees that I’ll see the notification from you! ?) I’d love to see your cookie bars and feature them in my Sunday Spotlight series! Line a 5-quart slow cooker with foil, and lightly coat with nonstick cooking spray. If any lands on the lip around the top of the porcelain bowl where the lid rests, wipe it off with a paper towel. In a medium bowl, whisk together the flour, baking powder, cornstarch, and salt. In a separate bowl, whisk together the butter, egg, egg white, and vanilla. Stir in the coconut sugar, mixing until completely dissolved. Add in the flour mixture, stirring until just incorporated. Fold in the dark chocolate chips and 1 ½ tablespoons of miniature chocolate chips. Spread the cookie dough into the prepared slow cooker, and gently press the remaining miniature chocolate chips on top. Place the slow cooker lid on top. Cook on LOW for 1 hour 45 minutes to 2 hours 15 minutes, or until the sides look firm and set while the center still looks slightly underdone. Turn off the slow cooker, remove the lid, and let the bars cool completely to room temperature in the slow cooker. Once at room temperature, let them set for at least 2 hours for the best texture. Notes: This is the 5-quart oval-shaped slow cooker that I used. 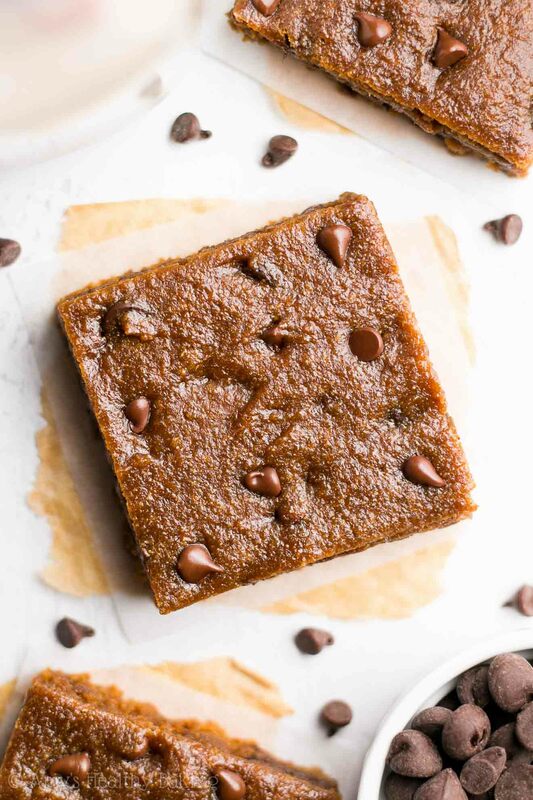 A 6-quart slow cooker may be used instead, but the cookie bars will be thinner and will most likely finish cooking in less time. Do not use any other size slow cooker. For the gluten-free flour, I recommend the following for the best taste and texture: 7 tablespoons (52g) millet flour, 6 tablespoons (45g) tapioca flour, ¼ cup (28g) coconut flour, and 1 teaspoon xanthan gum. Many store-bought gluten-free flour blends will work, if measured like this. If you prefer to use 2 full eggs, decrease the butter or coconut oil to 2 ½ tablespoons (35g). Light brown sugar may be substituted for the coconut sugar. Do not substitute liquid sweeteners (ie pure maple syrup, honey, etc.). Regular semisweet chocolate chips may be substituted for the dark chocolate chips. If you prefer to bake the cookies in the oven, use this recipe of mine (it’s very similar! 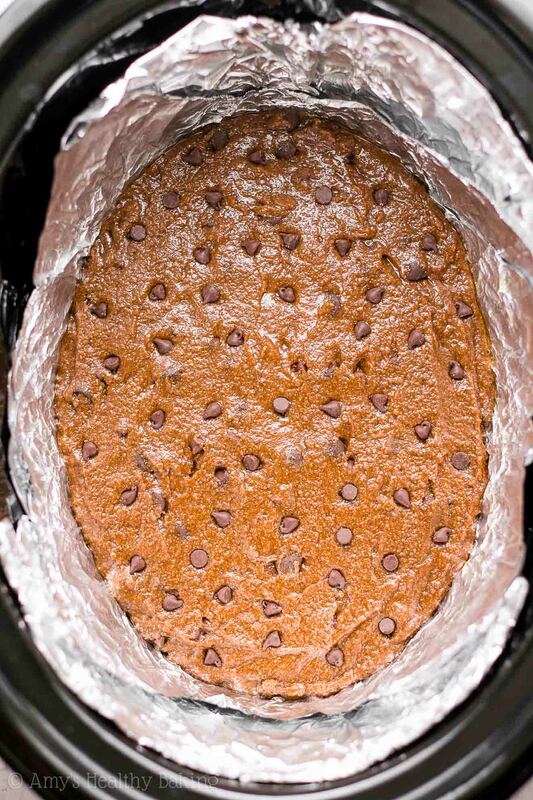 ), and press the cookie dough into a 13x9” rectangular cake pan coated with cooking spray. Bake at 350°F. Although I’m not entirely sure how long they’ll take to bake, the cookie bars will be done when the sides look fully cooked through and the center looks mostly set. I’m sorry if this is a stupid question but… I am trying to use more coconut flour in my baking and you said use 28g of coconut flour as a substitution …do I also need to use the other flours in your list along with the coconut flour or did you just list them so we knew exactly how much flour to use depending on what we want to substitute with? Thank you so much for this amazing website – my boyfriend and I are planning what healthy treats we can bake at weekends and this site is perfect! SO true about turning on the oven when it’s hot out! You have it especially bad with the humidity in NY too — you poor thing Marina!! Would regular Whole Wheat Flour be okay for this recipe? I have a huge bag of it I want use. If so how much? I already answered that question in the Notes section underneath the Instructions. 🙂 I can’t wait to hear what you think of the cookie bars Terri! This looks AMAZING! 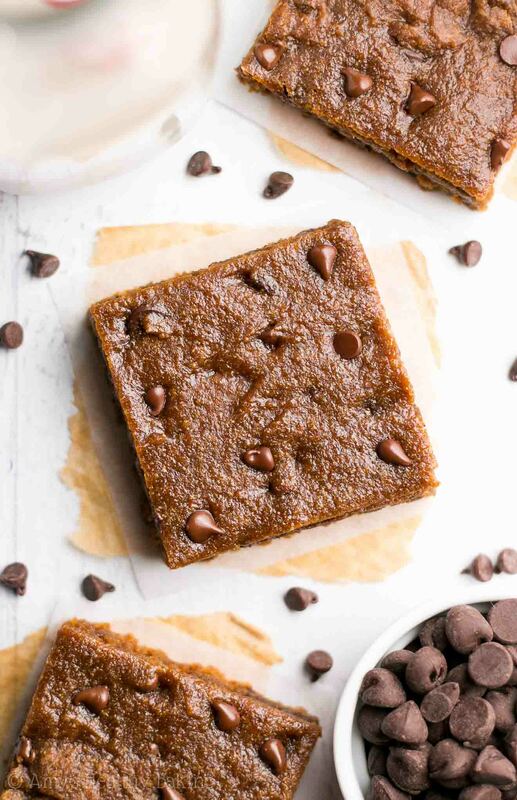 I love that I can make a healthy, ooey gooey chocolatey treat without turning on the oven! These look delicious! In the summer, I’m all about recipes that don’t require turning on the oven. this is a brilliant idea(: unfortunately, i live in a dorm right now and my slow cooker is only 1.5 quarts/: do you think I can divide the ingredients by 3 1/3 and still get the right taste/texture? I think that could work! For the butter and eggs, I’d recommend a little more than 1 tablespoon of butter (or coconut oil!) and 1 large egg white. That should make the math a little easier for you! 🙂 I’d love to hear how the cookie bars turn out Lei! Could you substitute the corn starch with cream of tartar? I really appreciate your interest in this recipe Whitney! I don’t recommend that substitution because the ingredients perform different functions in recipes. Cornstarch is a starch that absorbs liquid and helps keep these cookie bars soft, whereas cream of tartar is an acid that reacts with baking soda to make baked goods rise. If you don’t have cornstarch, then you can omit it, but these cookie bars will be just a tad bit less soft. 🙂 I’d love to hear what you think if you decide to try them!